� Vitamin C, released gradually for long-term effectiveness, decreases the number of melanin pigments contained in the epidermis. Thus it reduces existing hyperpigmentation and prevents future pigmentation. 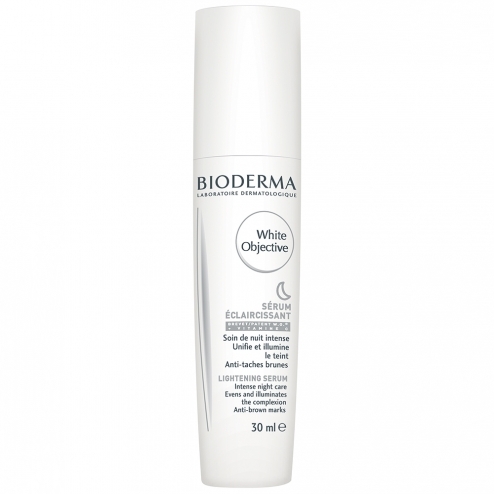 � BIODERMA innovation, the patented W.O.� works on the main mechanisms that cause skin pigmentation. The original nature of this multi-target attack ensures optimum lightening and preventive performance. � The intensive �peeling� action of glycolic acid triggers the elimination of heavily pigmented cells, reduces the intensity of the brown spots and reveals a radiant face. � The White Objective Serum �gel� texture is particularly pleasant and refreshing. Apply White Objective Serum in the evening to face and neck after cleansing, ideally with White Objective H2O, before your usual night cream. � White Objective Serum can be used directly on brown spots.